This American favorite is the perfect blend of savory flavors for creating the juicy, tender, crispy rotisserie chicken in a conventional oven. 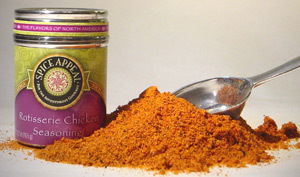 This blend of salt, onion, garlic, paprika, and other spices can either be used as a dry rub or as a wet marinade. Rub directly on the surface of chicken or combine with vegetable oil, and brush over the skin of chicken. In addition to the traditional chicken, try on steaks, pork chops, seafood, and hamburgers. Delicious as a rub for prime rib.